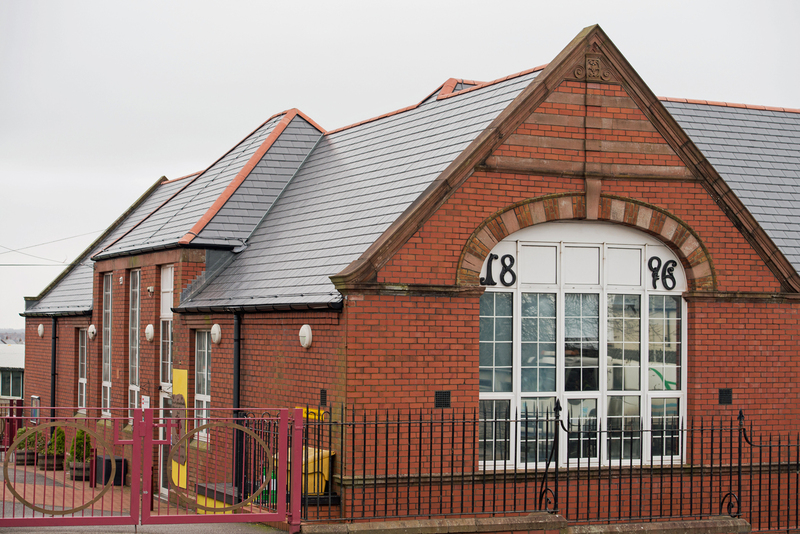 Safe, robust and theft-proof, Romilly Primary School is now set for many maintenance-free years thanks to the work and market-leading guarantee from BMI UK & Ireland and its BMI Redland and BMI Icopal products. 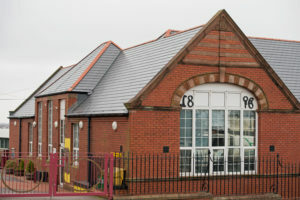 The school roof posed a tough challenge to Vale of Glamorgan Council as it was not only old, it was also immensely complex and susceptible to burglary. Built in 1893, the school is in a picturesque, exposed position upon a hill overlooking the sea. The roof not only incorporates many hips and valleys, it also has a 250m2 flat roof at its centre. Owing to its position, the pitched roof had been damaged by high winds and the ridge mortar had degraded over time. The problems from the natural causes had been compounded by crime – thieves had stripped most of the lead from the roof details, so the roof not only leaked, it also threatened the safety of the children in the playground beneath. There was also the issue of replacing the flat roof area in the centre of the school. Paul Hynam, the council’s construction consultant, set out a specification for the new roof: it should be secure, look like the existing roof, be low maintenance, resistant to theft and address environmental issues. The roof should also be quick to install so it could be fixed during the school holidays, eliminating potential disruption to the schools 700 pupils. 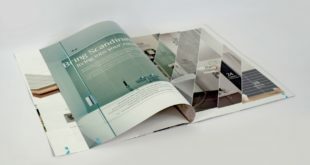 “I chose BMI UK & Ireland because, by using their BMI Redland and BMI Icopal products, they offered a solution that met the design brief, and provided support throughout the project,” explains Paul. 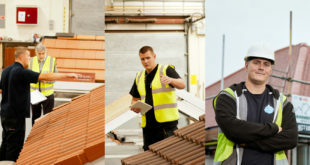 “Using their SpecMaster service gives you a 15-year guarantee complete with the design and on-site supervision – so you know that the roof has gone on correctly. In effect you can forget about the roof and maintenance for 15 years. 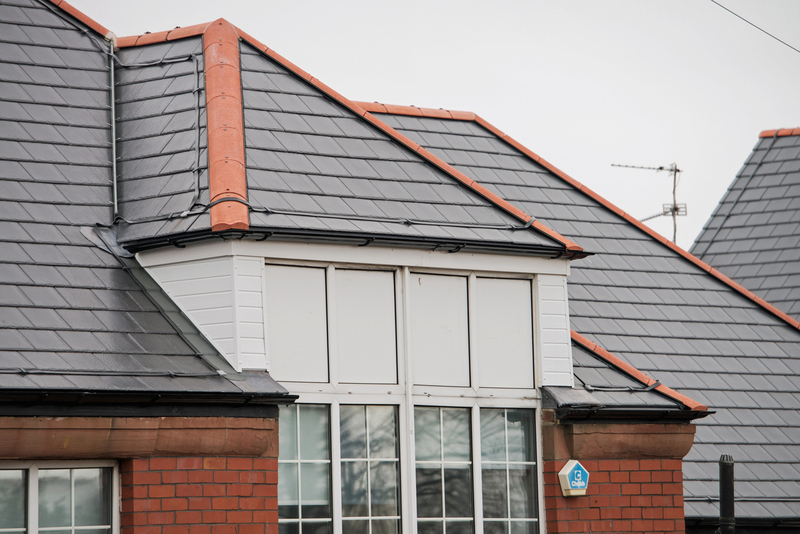 BMI Redland’s Cambrian Slate also meets our environmental criteria – it’s recycled – and it’s Welsh”. The council had previously used different manufacturers for the flat and pitched roof, which caused issues. When there was a problem, usually at the point that the two different systems met, the manufacturers would very often blame each other and neither would accept responsibility. By using pitched and flat solutions together from BMI they will no longer have this problem. 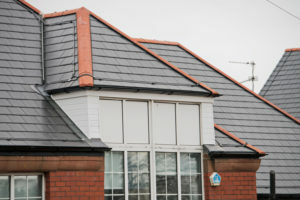 For the pitched roof covering, BMI Redland Cambrian Slate was specified. 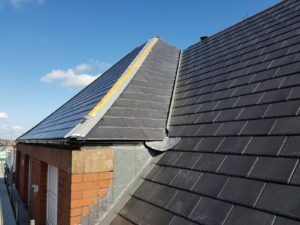 An interlocking slate with three fixings, Cambrian works well in exposed situations and is made from recycled waste slate in nearby Merthyr Tydfil. To reduce maintenance, the slates were installed using a dry system, with fixings on the ridge and hip system to imitate the previous roof. Because the school had a vaulted ceiling construction within it, venting was an issue at eaves level so BMI 4.5k ThruVent Tiles were deployed, rather than standard eaves vents. 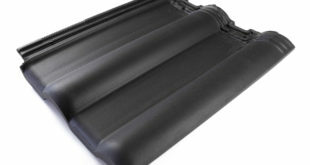 The flat roof covering chosen was BMI Icopal Universal® – a 3.2mm single ply covering that is UV resistant and tough but also light and malleable, making it ideal for detailed roofing features. To boost thermal performance, BMI Area Technical Manager specified Thermazone Roofboard Insulation, which was laid on the existing PUR/ PIR insulation and employed the existing vapour control layer as a vapour check. To deal with the potentially problematic interface between the pitched and flat roofs, it was specified that the waterproofing was taken under the slates and up to the top of the eaves batten – a detail monitored during installation. Now Vale of Glamorgan Council has peace of mind for years to come with the both pitched roof and flat roofs variously guaranteed or warrantied under the schemes provided by BMI UK & Ireland when roofs are designed and installed to its specifications.